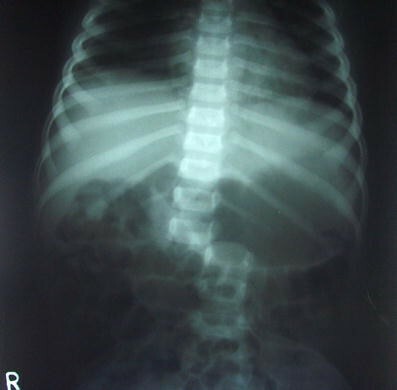 A 4-year-old girl presented to the emergency room of the Manipal Teaching Hospital, a tertiary care hospital in Pokhara, Nepal, with history of a fall from a height of 10 m. After the fall she had flaccid paraplegia with no sensation below the groin, and no sensation of the bladder or bowel. On examination, she was conscious, cooperative, oriented to time, place, and person. Her blood pressure was 80/60 mmHg, pulse 120/min, visible deformity around the L1 region, grade 0 power in the lower limbs, no sensation below L1 bilaterally, and distension of the bladder. There was no other systemic injury. The X-ray showed a lateral lumbar spondyloptosis, with the L1 vertebral body almost parallel to the L2 body, which would have created the infamous “double vertebra sign” on CT scan had one been performed. Traumatic spondyloptosis, or grade V spondylolisthesis, is defined as greater than 100% traumatic subluxation of one vertebral body in the coronal or sagittal plane [1, 2]. 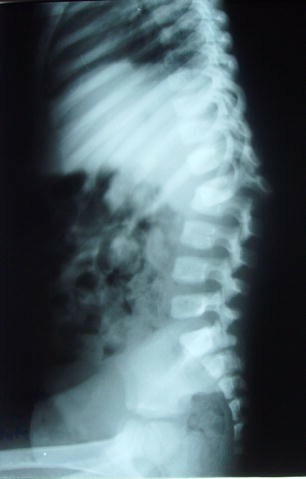 The lateral view X-ray confirmed the diagnosis of spondyloptosis with the L1 body overlapping the L2 body. CT scan could not be done due to equipment malfunction. Complete fracture dislocation, or traumatic spondyloptosis, is rare in lumbar regions cranial to the lumbosacral junction, with only six cases previously reported [3–6, 7, 8]. On referring to journals, we found that this is the first reported case of a young patient with lateral lumbar spondyloptosis. The parents of the child opted for surgery, having beeen fully informed about the fact that her neurological recovery would be minimal. A L2, 3 laminectomy was done. Skin traction was performed, and per-operative reduction under direct vision was achieved. Laminar hooks and rods were used to maintain the reduction. She was kept on bed rest. She improved in power in the left lower limb from grade 0 to grade 3 within 2 days. However, her parents wanted her to be transferred home, and she was discharged.